Some companies may think that organic marketing tactics (e.g., blogs and ebooks) are all they need to grow their customer bases. But paid marketing outreach—like sponsored content and ads—can be quite effective, too. Learn how today’s strongest marketing strategies combine the best of both worlds—organic and paid—to help businesses achieve the outcomes they’re looking for. A marketing and sales plan that doesn’t emphasize both organic and paid elements is not only incomplete, it’s stunting your company’s growth. What follows is a primer on how organic and paid marketing work together to drive growth and generate significant ROI for your marketing investments. Organic marketing like blogs, social media posts, ebooks, infographics are best used to develop your brand’s voice. They also enable authentic interactions with customers, educate and convert readers and drive traffic to your website, landing pages and other online assets. Also known as inbound marketing—people come to you because they’re attracted by your content they find in search engines and on social networks—organic marketing sits at the top of the awareness stage of your funnel. Here’s what organic marketing looks like: Let’s say your company publishes a variety of SEO-optimized blog posts on your website each month. These blogs are closely aligned with what your customers care about: your products and services, your business operations, news about your employees, and even content that focuses on the broader industry your business operates in. To get eyeballs on your content, you promote these blogs on social media—tagging influencers and brands when appropriate. You also highlight this content in the weekly or monthly newsletters you send out to your subscribers. As you continue moving your organic marketing efforts forward, you use a service like Google Analytics to analyze your traffic to see which posts are most popular and which topics your customers are most interested in. These metrics help you identify which blog posts are most effective at driving sales and leads. They also help you figure out what cornerstone content drives traffic to your site without requiring any additional marketing support. 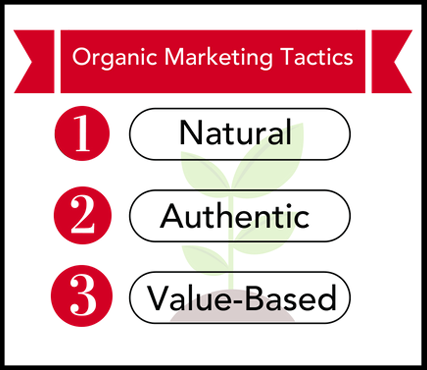 Organic marketing tactics are natural, authentic and value-based. With the right approach, customers will learn to visit your site regularly over time because they won’t want to miss out on the content you’re publishing. Although you’re doing less “pushing” with organic marketing, you can generate a ton of loyal traffic with a proper strategy. Remember, this is about building high-value brand equity and becoming an industry authority with your customers—and among your peers. It’s not just about driving sales; you’re working hard to engage and educate your target audience. Educating customers. Why do they need your products or services? What problems do they have that they aren’t aware of? What advice can you give them to make their lives easier? Optimizing blog content and pages for SEO. Think it’s not that big of a deal? How would you like to boost traffic to your site by 571%? Moving the needle on high-level company goals. What’s coming down the pipeline over the next few quarters? Start talking about it now. Driving authority in your niche or industry. Organic marketing enables you to demonstrate your thought leadership and establish yourself as an authority. 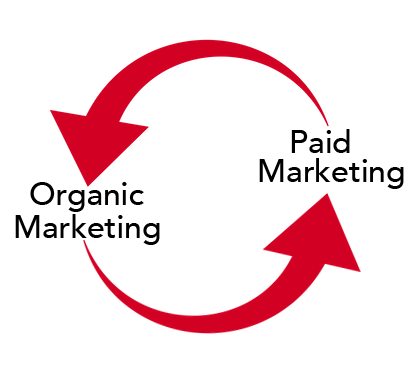 Using targeted inbound/outbound linking strategies. Strategic investments can help you get the most bang for your buck from your organic marketing efforts. Building a long-lasting brand. Business is about more than selling products. It’s about establishing long-term relationships with customers. Organic marketing helps make that happen. Find out which pieces of content are most popular among your readers so you can create similar assets. Organic traffic. See which pieces of content are getting the most traffic from search engines so you can replicate that success. Leads and sales. Determine how many leads and sales are being driven from specific pieces of content and landing pages. Figure out whether your customers are most persuaded by blog posts, infographics, social media content, email or other forms of content. Search Traffic. When you content is compelling, people revisit regularly and possibly even link to it. This tells Google you’re an authority and they’re likely to increase your search ranking as a result. 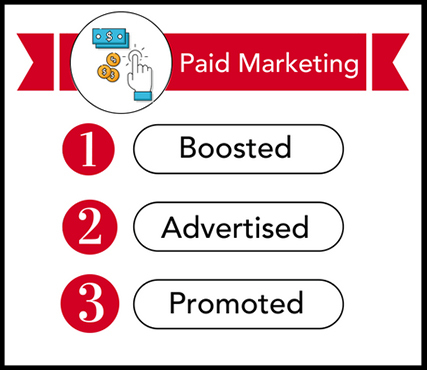 Now that you’ve got a solid understanding of how organic marketing works, let’s shift our attention to the other side of the equation: paid marketing. Organic marketing requires you to wait for your customers to find your content, but paid marketing involves you “pushing” content out to your target audience. As such, it’s much more sales-oriented and focused on driving specific actions (e.g., making a purchase or attending a webinar). An illustration: You’ve been given new quarterly goals. To hit those goals, you need to ensure that your marketing campaign works effectively. This requires testing and refining five or so sets of ads over the next 10 weeks. Once the data comes back, you know which ads are performing the best. You then dedicate the last two weeks of the quarter to supporting your top-performing ads. At the end of the quarter, you analyze your results to determine key success metrics (e.g., total amount spent and return on ad spend). Armed with that data, you refine your approach for the next quarter. Paid marketing is most effective in driving quick results or making a hard sell. Each paid ad will likely point to a product page, a landing page or some other online asset that has the potential to drive financial results. Unfortunately, you can’t just spend money on ads and think that your efforts will be successful just by tracking vanity metrics (e.g., engagement and leads). You need to make sure your return on ad spend (ROAS) is efficient. For example, if you spent $5,000 on a paid marketing campaign but only got five leads, you’ll probably want to refine your efforts (unless you work in an industry where that price isn’t too steep). Achieving solid ROI and ROAS. If you’re not getting a high enough return on your investments, you’ll have to rethink your strategy. Conversion rates. Find out which ads have successfully convert customers into doing your desired action (e.g., signing up for a subscription). Ad engagement. Determine which optimizable components (e.g., images, text or calls-to-action) have the highest probability of encouraging customers to click. Discover which platforms (e.g., Facebook or LinkedIn) drive the most leads—and the highest converting leads. Ad types. Figure out which kinds of ad types (e.g., boosts, retargeting or lookalike audience ads) drive the highest overall conversion rates. Paid and organic marketing complement each other well. You may have noticed that there are some areas of overlap between the two. For example, both can be used to drive engagement, acquisition and conversion—just in their own unique ways. Not every business will have the budget—or even the need—to deploy paid marketing campaigns. Every business does, however, need to embrace organic marketing. 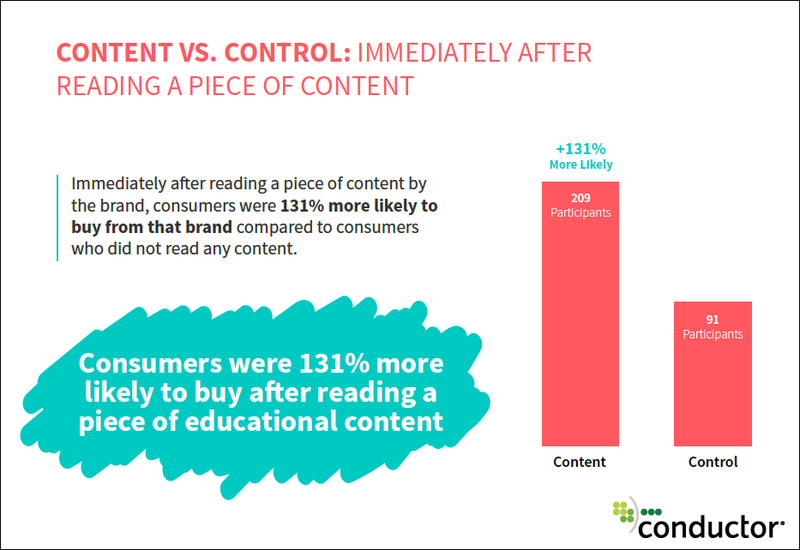 You give customers fewer ways to connect with your brand; customers are 131% more likely to buy your products after consuming early-stage educational content. As you build out your marketing strategy, it’s important to consider how you can best address your business goals through a combination of organic and paid marketing tactics. Some goals may lend themselves to one tactic or the other while other goals may require a combination of both. Either way, both types of marketing will help you achieve your goals with impact and efficiency. When both organic and paid marketing are feeding your funnel successfully, you’ll know you’ve found the perfect balance. Then all you’ll have to do is test and fine-tune your strategy along the way.